Today, the entire global economy is deflating. Industrial demand and manufacturing are collapsing worldwide. Once economic deflation is underway, debt snowballs. The Federal Reserve will turn the money spigots wide open to mitigate the paralyzing effects of deflation on the U.S. consumption-economy. For now, the dollar is strong because the yen and the Euro are weakening FASTER; but the true value of the dollar is declining. There are striking parallels between the U.S. economy [since 2007] and the economy of the German Weimar Republic [1920s]. When recession hit the German economy, the central bank printed massive amounts of currency to stimulate business activity and pay debt. The cost of living was rising, the middle class was getting poorer, and debt was growing. Although core fundamentals in the economy were deteriorating, industrial magnates benefited from money-printing. Easy credit enabled business leaders to wipe out their debts with cheap money. They expanded plants, bought companies, and speculated in foreign exchange with borrowed money. Germany’s booming stock market was the envy of Europe. But all of a sudden, market psychology changed. One minute the rich were borrowing like crazy. Overnight, no one wanted to buy the debt. There were no warning signals before credit collapsed. Just months before credit crashed, Germany’s economics Ph.D.s had insisted money printing by the central bank was not a problem. They said inflation was low and manageable –even healthy– and proved it by documenting the country’s low inflation numbers. 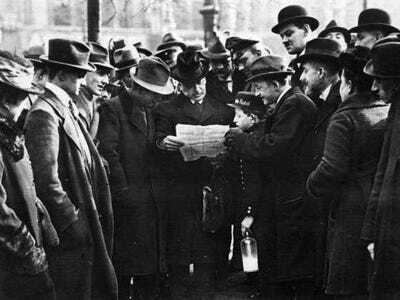 In 1921 and 1922, politicians and eminent economists maintained there was no inflation in the Weimar Republic; but a sudden loss of confidence triggered the madness of hyperinflation. By 1923, one U.S. penny equaled 42 billion marks (ℳ). The following gold and silver charts demonstrate how quickly the paper mark (ℳ) lost value as the destruction of hyperinflation swept over the highly civilized society. The small minority who had the foresight to exchange their paper marks for gold early saved their capital. The state quickly imposed restrictive currency laws and rigid capital controls. mark strengthened against other currencies. Price inflation in the autumn. To 4.2 trillion marks per gold-backed US $1. April rate of price inflation was 6%. Price stability in the spring. After money velocity took off, Germans could no longer exchange their paper marks for gold on the black market. No one would sell an ounce of gold for paper marks at any price. Germany ran huge deficits and lived far beyond its means. The country had little manufacturing for export, extremely high taxation, and staggering debt (for war and social reforms). The purchasing power of the currency was decreasing steadily (gold-backing was removed in 1914); and the tax-base was shrinking. As revenues declined, spending accelerated on welfare, education, and national healthcare. The Weimar government financed the vast majority of its expenditures by borrowing. The government issued notes (promises to pay); the Reichsbank in Berlin issued money on the ‘security’ of the promissory notes. The central bank was the back-stop, keeping interest rates artificially low and ‘monetizing’ the debt. Leaders said money-printing was necessary for jobs. During the inflationary boom, Germany had over-employment. The government was padded with bureaucrats; and industry was heavily subsidized by the state. Low-skilled workers were employed in make-work and short-time jobs, with excessive redundancy. 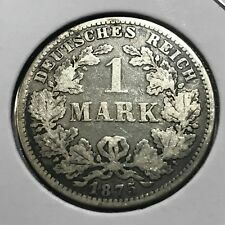 The Reichsbank frequently intervened in the foreign exchange market to defend the mark, squashing investors who were speculating against the currency. • As credit expanded, a speculative bubble grew, and the stock market soared→ 1920, 1921, 1922. • Stability existed as long as market participants believed it would last a little longer. • Speculators did not realize the stock market was going up because the German mark (ℳ) was going down. The economy looked good on paper. However, the falling value of the currency took its toll on everyone but the rich. Living standards for average people and those on fixed incomes declined. To protect against rising prices, people began to stock up on groceries and other necessities. 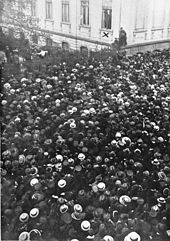 Workers demanded higher wages to compensate for their loss of purchasing power. RECESSION CAUSED DEBTS TO RISE. When the economy stalled, the government wildly expanded the money supply to pay debts, avoid civil unrest, and stave off bankruptcies. But once stagnation took hold, easy money could not stop fundamental economic deterioration. Suddenly, lack of faith in the currency triggered ferocious money velocity (see charts above). Price inflation out-paced the printing press: No matter how much money the bank printed, there was never enough! Businesses paid suppliers and employees with IOUs/ coupons; municipalities issued their own currencies; neither banks nor government could honor checks. Hungry people resorted to barter. By August, many villages had no food. THE FARMER WAS KING. A loaf of bread cost 200 billion marks at the end of the currency collapse. But prices for commodities remained steady for those who paid in silver marks. When Germans purchased bread with silver, the price was about the same in Weimar as it was in America [measured in ounces of silver]. The Chancellor declared martial law at the end of September, 1923. After the collapse of the paper mark, a new currency was re-set at 1,000,000,000,000 papiermarks to 1 Rentenmark. A life’s savings could by one stamp for a letter. Pensioners and bond-holders were ruined utterly. After 1924, societal destruction and mass-unemployment ushered in Hitler’s reign of NATIONAL SOCIALISM [NAZI]. Adolf Hitler got his 19% support from the disenfranchised workers and millions in the lower class who lost their jobs when the inflationary boom ended in depression. Heinz Habedank, Die Reichsbank in der Weimarer Republik: Zur Rolle der Zentralbank in der Politik des deutschen Imperialismus 1919-1933; Steven B. Webb, The Supply of Money and Reichsbank Financing of Government and Corporate Debt in Germany, 1919-1923, “The Journal of Economic History,” Vol. 44, No. 2, The Tasks of Economic History (June, 1984), pp. 499-507, Cambridge Univ. Press. Includes articles on NAKED SHORTING.